After eight long days of play, the 2013 Aussie Millions Main Event has come to an end with 29-year-old Mervin “The Cat” Chan of Malaysia emerging victorious over a 629-player field to win AU$1.6 million, a Chrysler 300C car, and the Southern Hemisphere’s most prestigious title. The final table began with Dan Shak, who won the $100,000 Challenge back in 2010 and finished fourth in it earlier in the week for AU$237,000, as chip leader with 3,775,000. 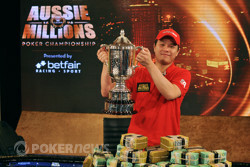 In addition, Jay Tan was trying to best her boyfriend "Hong Kong" Kenny Wong's runner-up finish in the 2012 Aussie Millions Main Event; Joseph Cabret was representing the local Melbourne contingent; and fan-favorite Patrik Antonius was looking for the biggest tournament score of his career. On Day 5, action picked up in Level 23 with the blinds at 15,000/30,000/5,000, and it was there that the first elimination of the day occurred. It happened when Antonius opened to 60,000 from under the gun, Shak called on his direct left, and Tan three-bet to 175,000 on his direct left. The action folded back to Antonius, and he four-bet to 385,000. Shak quickly folded, and Tan moved all in for around one million chips. Antonius snap-called. The flop was , which didn't improve Tan at all. The on the turn took away one of her outs, and the on the river ender her 2013 Aussie Millions Main Event. While Tan didn’t best her boyfriend’s runner-up finish in 2012, back-to-back final tables is a fine accomplishment for the endearing poker couple. The next elimination came in Level 24 with the blinds at 20,000/40,000/5,000 when New Zealand's [Removed:17] open-shoved for 780,000 under the gun and received a call from Chan in the cutoff. The button and both blinds folded and the cards were turned up. It was a bad spot for the PokerStars SuperNova Elite as he had run pocket eights into a bigger pocket pair. According to the PokerNews Odds Calculator, Chan was an 81.31% favorite and Yan only had a 18.23% chance of survival. That dropped to 13.23% on the flop, which gave him a running straight draw, but the useless turn bumped him down to just 4.55%. Yan needed an eight on the river to survive, but it wasn't in the cards as the peeled off. With that, Yan was eliminated in sixth place for AU$220,000. It took nearly six hours for the next elimination to occur, which happened midway through Level 26 with the blinds at 40,000/80,000/10,000. It happened when Joe Cabret opened for 160,000 under the gun for 160,000 and then called when Australian Jerrod Glennon three-bet to 375,000 from the button. Cabret then check-called a bet of 325,000 on the flop before leading out for 825,000 on the turn. Glennon called, the peeled off on the river, and Cabret moved all in. Glennon hit the tank for a solid eight minutes weighing the decision. He shifted in his chair, shook his head, and continued to ruffle chips. Eventually he called off his remaining 2 million or so and Cabret revealed for a flush. Glennon looked crushed and simply tossed his cards to the dealer before exiting the tournament in fifth place for AU$290,000. Interestingly, Shak had come close to a title in the 2013 Aussie Millions $100,000 Challenge when he finished in fourth place for AU$237,000, and his bid at the Main Event title came to an end in the same place. It happened in Level 27 with the blinds at 50,000/100,000/10,000 when Shak opened for 250,000 under the gun and was met by a three-bet to 760,000 by Cabret on the button. The blinds both folded, Shak moved all in, and Cabret snap-called. It was a bad time for Shak to shove as Cabret had him crushed. The flop gave both a pair of aces, but Cabret's king kicker had him well out in front. Neither the turn nor river helped Shak and once again he had to be satisfied with a fourth-place finish, this one good for AU$400,000. Three-handed play lasted through Level 28, and at that point tournament officials made the decision to stop play around six in the morning and come back ten hours later to play it out. After a good night’s sleep, Antonius, Chan and Cabret returned to battle it out, and it didn’t take long for the fireworks to fly. Early on Day 6 a huge hand developed that saw Chan double through Antonius. It happened in Level 29 with the blinds at 80,000/160,000/10,000 when Chan opened for 325,000 from the button and Antonius three-bet jammed for 4.96 million in the small blind. Joseph Cabret folded from the big and Chan snap-called. Antonius had shoved quite a few times late on Day 5 and early today, but he picked the wrong spot here as he was well behind. His best chance of winning was to catch an ace, but he was left wanting as the board ran out . Antonius was eliminated on the very next hand, earning AU$600,000 for his third-place finish. From there, it only took a few hands into heads-up play for a winner to be determined. It happened when Chan raised to 320,000 and then called when Cabret three-bet to 860,000. Both players checked the flop, the turned, and that's when things heated up. Cabret, who was first to act, led out for 1.2 million, Chan raised to 3 million, and Cabret moved all in. Chan snap-called and tabled the for trips, and he was out in front of Cabret's flush draw. The dealer burned one more time and put out the , the last card of the 2013 Aussie Millions Main Event. That does it for our coverage from the 2013 Aussie Millions Main Event, but you can still follow our updates from the $25,000 Challenge. Simply visit our Live Reporting Section. It only took a few hands into heads-up play for a winner to be determined. It happened when Mervin Chan raised to 320,000 and then called when Joseph Cabret three-bet to 860,000. Both players checked the flop, the turned, and that's when things heated up. Cabret, who was first to act, led out for 1.2 million, Chan raised to 3 million, and Cabret moved all in. Chan snap-called and tabled the for trips, and he was out in front of Cabret's flush draw. The dealer burned one more time and put out the , the last card of the 2013 Aussie Millions Main Event. The remaining two players are now on a short break. 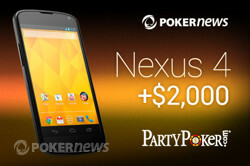 One of the most sought-after gadgets in the world, the Nexus 4 smartphone, has been out of stock more than it has been available, but PartyPoker is offering PokerNews customers the chance to get their hands on one — and a share of $2,000. On Feb. 9 at 15:00 ET (20:00 GMT), PartyPoker is hosting an Aussie Millions Freeroll that is exclusive to PokerNews customers. Players who makes their first deposits on PartyPoker between Jan. 28 and Feb. 9 will automatically be entered into the PokerNews Aussie Millions Freeroll. With the qualification period only being open for 12 days, the freeroll field size should be much smaller than usual, meaning your chance of getting your hands on a brand new Nexus 4 is greater. Patrik Antonius moved all in on the button, Joseph Cabret called, Mervin Chan raised in the big blind to nearly 400,000, and Cabret called. The two checked id down as the board ran out . Cabret showed a diamond, which won him the pot. Antonius mucked, and will receive AU$600,000 for his efforts. A huge hand developed that saw Mervin Chan double and Patrik Antonius left with just one big blind. It happened when Chan opened for 325,000 from the button and Antonius three-bet jammed for 4.96 million in the small blind. Joseph Cabret folded from the big and Chan snap-called. Antonius had shoved quite a few times late on Day 5 and early today, but he picked the wrong spot here as he was well behind. His best chance of winning was to catch an ace, but he was left wanting as the board ran out . 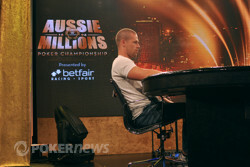 Joseph Cabret limped in on the button, Mervin Chan raised to 550,000 from the small blind, and Patrik Antonius folded. Cabret folded as well. Patrik Antonius raised to 375,000 on the button, Joseph Cabret called in the big blind, and the flop fell . Both players checked, The turn was the . Cabret checked, and Antonius fired 350,000. Cabret folded. Who Will Become the Next 2013 Aussie Millions Champion? Welcome to the 2013 Aussie Millions Main Event Final Table!